One of the places we visited in Lincoln, Nebraska during my short trip there was the Sunken Gardens. This small locale in the middle of the city is a quiet refuge of wildlife and plants, in essence an oasis of calm to retreat to. There weren't many other people visiting while we were there so we had a chance to wander the reflective pools and amazing cut-out gazebo without interruption. I share the picture of this wonderful retreat with all of you today. We entered walking alongside a small but musical waterfall with several smaller drops giving moisture to the air and sound to our ears. This photo shows two of the smaller drops, one near the red rock towards the top, the other nearer the bottom. 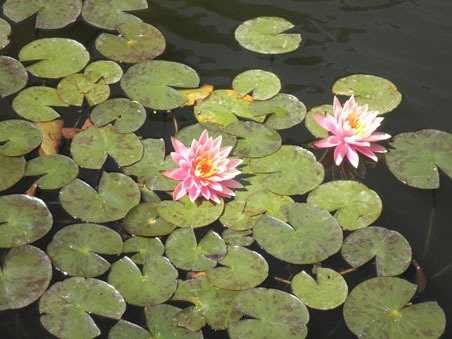 There were two reflecting ponds featuring water lilies and koi. 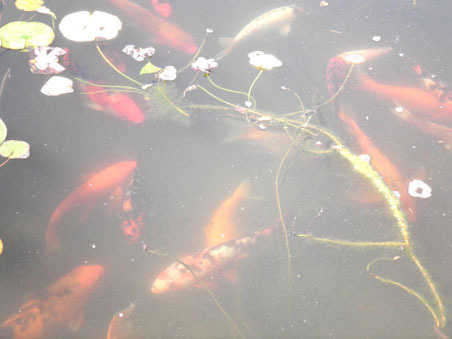 As I walked around on the ledge, the koi followed me like a dog following at my heel. Everyone laughed at my unusual 'pets'. 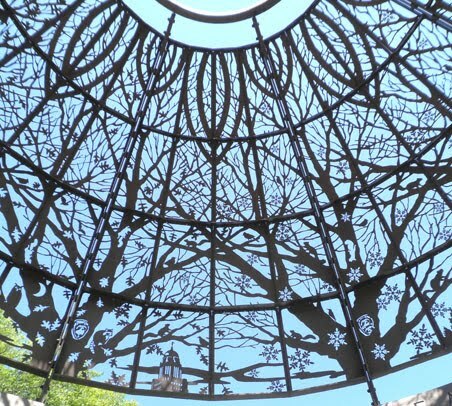 The gardens also featured this incredible laser-cut open dome gazebo. At night it is lit, but I didn't have a chance to see it during the nighttime hours. It was stunningly beautiful during the day too, however. What a lovely spot. I particularly like the gazebo. The gazebo just blew me away. It is a much larger version of the kind of work I've been planning and I was in love. That does look peaceful. I'm insatiable when it comes to waterfalls, whatever their size. I adore waterfalls, probably one really good reason why I am in love with Imladris. Lovely and calming. I have just finished my daily yoga practice, and I find the first picture quite relaxing. I know so many people who are into yoga. I tried it when I was young and didn't care for it, but I may have to try it again. It is so very pretty. :) I don't suppose you had time to see Arbor Lodge did you? I have never heard of Arbor Lodge, so I had to do a quick look-up for it. I'm sure I'll end up doing this trip again, my cousin and I are determined that we won't let another 20 years pass between gab-fests and we have books to work on. I'll be sure to try and catch it the next time because it looks quite lovely. That is indeed a beautiful gazebo! I was floored by how exquisite the gazebo was. I really loved this little park. 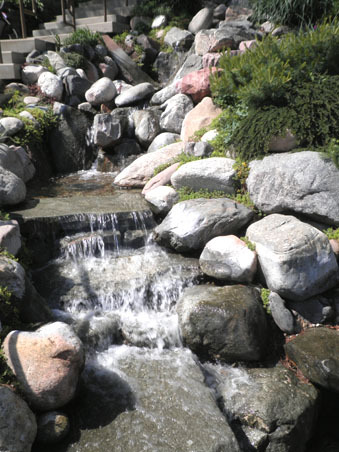 I am a total waterfall lover and could instantly hear the delicious sounds of the water singing along the rocks. 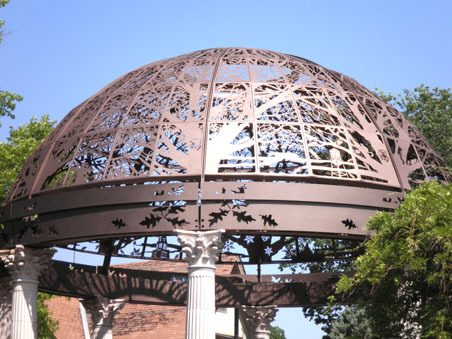 I can so imagine a rest beneath that ironwork gazebo and listening to the water falls and just zoning out the world. I love waterfalls, have one in my livingroom and wouldn't mind more. And thanks for friending me, welcome!!! I had a wonderful time. I hope your weekend was as nice.